Professor Emeritus Pieter Croissant Wensink passed away on October 2, 2012 in Wellesley, MA. 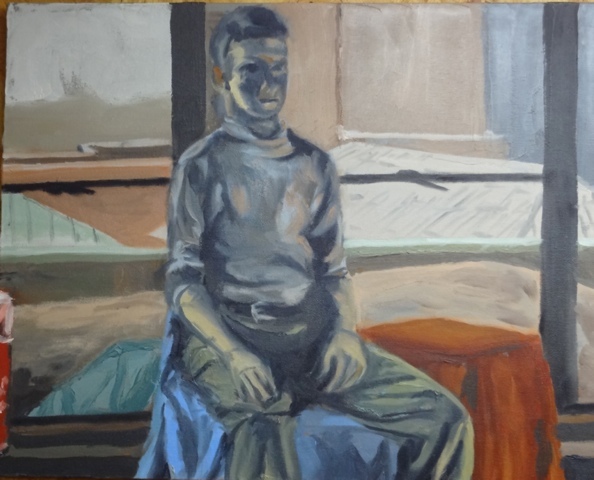 Pieter was born in Washington, DC, in 1941, and grew up in Bethesda and Chevy Chase, MD. He attended Lawrence College in Appleton, WI, but like many young people in the 60s, dropped out. He ended up working in a laboratory at Johns Hopkins, where he discovered a passion for science. He never got his BA, but by taking night courses Pieter got himself accepted as a graduate student at Johns Hopkins, where he received his PhD in Biology in 1971, working with Don Brown, a pioneer in studying the regulation of gene expression in frogs. Pieter then went to Stanford, where he did post-doctoral work with David Hogness. At Stanford, Pieter got in on the ground floor of the new recombinant DNA technology. He published, with Hogness, a landmark paper entitled “A system for mapping DNA sequences in the chromosomes of Drosophila melanogaster” – the fruit fly. In 1975 Pieter came to Brandeis as an Assistant Professor in the Rosenstiel Center and in the Department of Biochemistry, bringing to Boston the then-rare and prized knowledge of how to clone genes. I remember clearly in 1976 when an MIT professor, David Botstein, and his postdoc, Tom Petes, camped out at Brandeis for several weeks learning from Pieter how to clone yeast genes. Their collaboration resulted in another major paper “Isolation and analysis of recombinant DNA molecules containing yeast DNA.” Soon thereafter Matthew Mesleson arrived from Harvard, to collaborate with Pieter on the “Sequence organization and transcription at two heat-shock loci in Drosophila.” All of these papers were pioneering works. Pieter also taught these “dark arts” to the people in my lab and launched us and others at Brandeis on the way to understanding the mysteries of chromosome architecture and gene regulation. In 1981 Pieter also wrote a book in collaboration with his Biochemistry colleague Bob Schleif: Practical Methods in Molecular Biology. Pieter’s own work, carried out with a series of superb graduate students, focused on genes that encode the proteins that make up the yolk of Drosophila eggs. The study of these genes revealed the complicated way that yolk protein genes are turned on only in females and only in their ovaries. Many of Pieter’s students are now Professors in their own right at major universities around the country. In the early 1990s Pieter was diagnosed with a benign brain tumor – a meningioma – that required two surgeries to extirpate. Probably his tumor was the result of the now-impossible-to-believe treatment of a ringworm infection with X-rays when he was about 2 years old. The second operation left him unable to concentrate as he had, and Pieter, sadly, decided that he could no longer run his lab or give the clear lectures had had been offering. So he left Brandeis as an emeritus Professor with a medical disability. Pieter was remarkably calm and accepting about his situation. 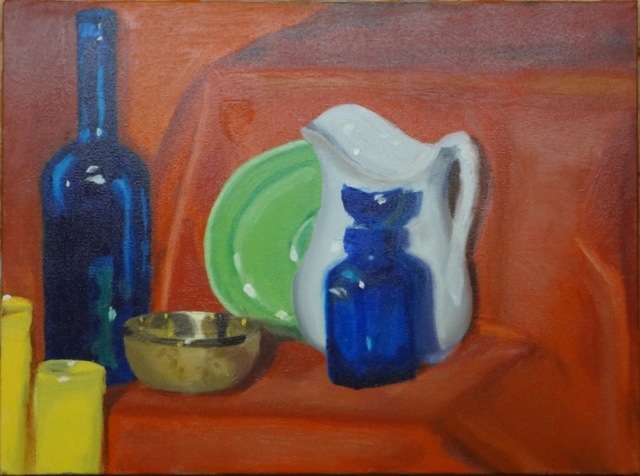 He decided to pursue a long-deferred passion to paint, and some years ago he earned his BFA with distinction in painting from the Massachuetts College of Art. Altogether, Pieter had 5 operations on the cancers that led to his death. Pieter’s greatest joy in life was his family. He was married to Dorothy E. (Perry) for 43 years and was the devoted father of Tom, Alan and Joe (who recently earned his PhD in English from Brandeis). 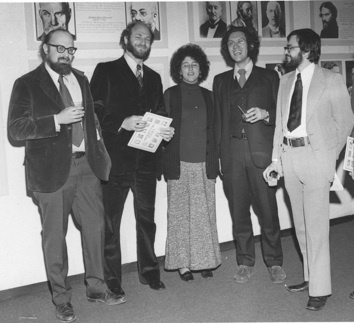 Most of you never met Pieter, so I thought it would be good to see Pieter and some of his colleagues as we looked in the late1970s (Pieter, Michael Rosbash, Marion Nestle (now oft-interviewed nutritionist at NYU), myself, and David DeRosier). And to see two of his paintings. He was a fine man.